We had some quality time with the Dell XPS 13 and the Lenovo U300s in a side-by-side test during the recent Ultrabooknews Webcast. 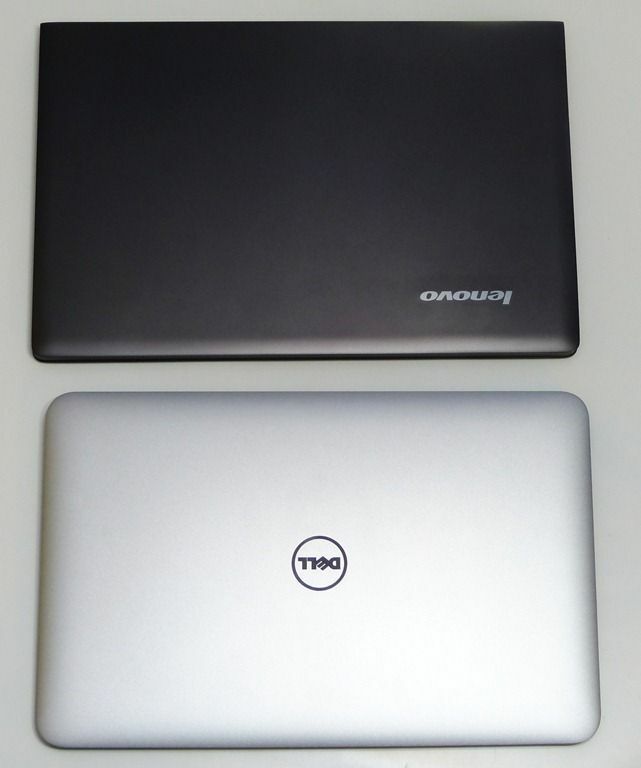 Here are some notes that might help you choose between these two gorgeous Ultrabooks. The Dell can get warm – in a bad way. The heat starts to radiate through the keyboard. 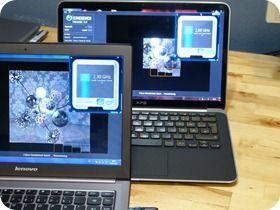 This only occurs under load but it’s significantly more than other Ultrabooks. It’s the only thing that raised a red flag for us during testing. Having said that, the Dell appears to be aggressively tuned to use Turbo boost. This heat issue could be trade-off that’s made in high-performance scnearios. There’s little heat or noise in normal web-based use. Fan output on the Dell XPS 13 between the screen hinge and keyboard. 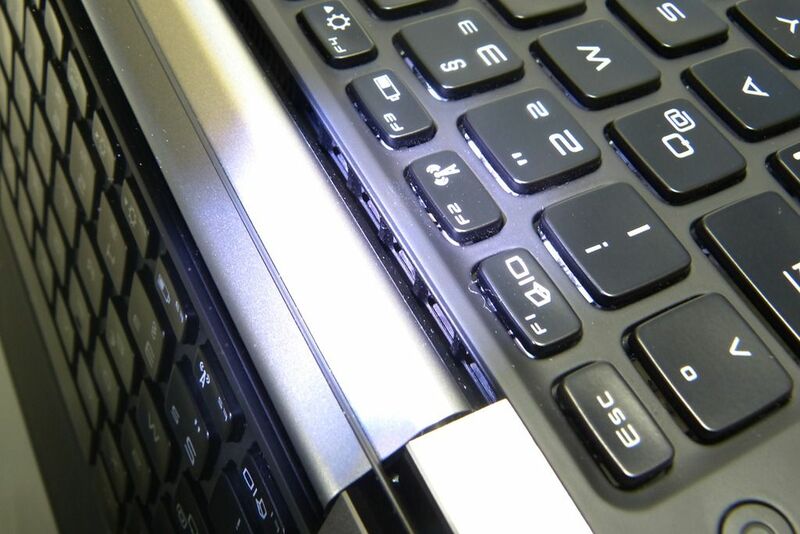 Heat can also radiate back through the keyboard under heavy loads. 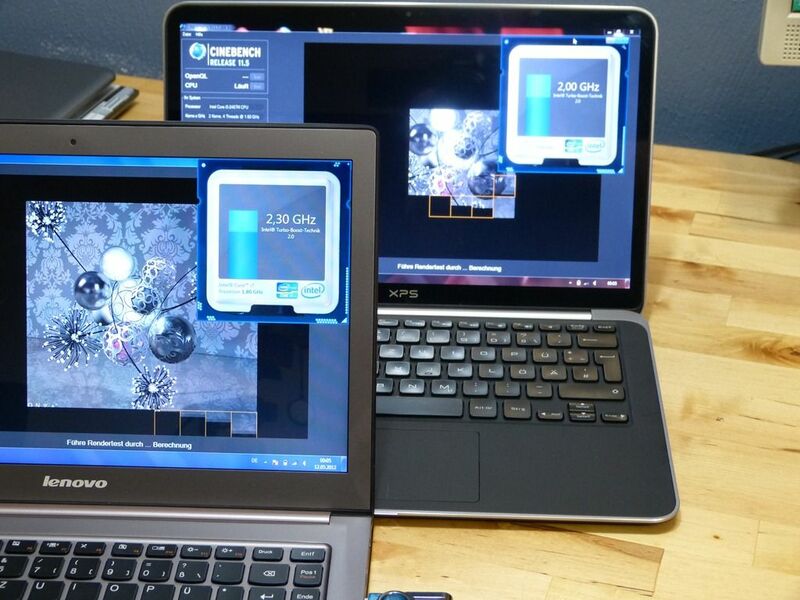 The Dell performed well for a Core i5 beating the Aspire S3 and the Samsung Series 5. Other Ultrabook results (from our reviews) are below. Keyboard: Good travel on Dell, not as much feedback as Lenovo though. Lenovo wins for us. 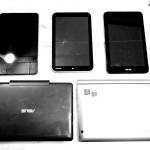 Touchpads not extensively tested yet. We’ll refrain from opinion on that right now. Very solid screen build and hinge on the Dell. Lenovo screen has slightly larger viewing angles. Neither are IPS screens. In my testing yesterday, I felt that the SSD might be quicker on the Dell. I haven’t done any specific tests though. The Lenovo U300s is the boardroom winner. It oozes class. 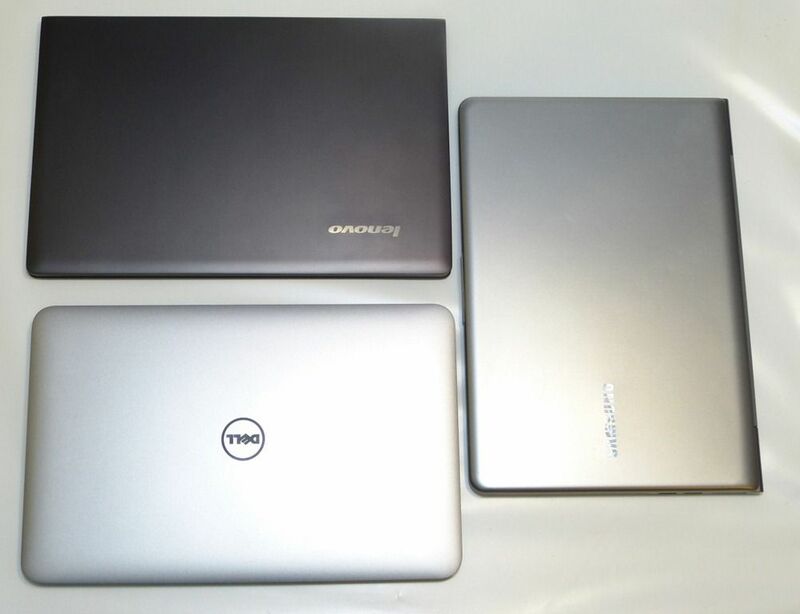 The Dell XPS 13 is the consumer style choice. it’s impressive to look at and use. Both have a limited port set (no SD card or VGA port.) . We are a little worried about the heat generated by the Dell and I certainly would not recommend it for gaming due to that. Dell have done a great job on the fascia though. The thin screen bezel, the feel of the keyboard are and the appeal as you actually use the device are, possibly, the best of any Ultrabook. 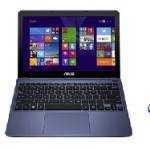 The Dell XPS 13 a touch smaller than any other Ultrabook too as a result of the thin bezel. It’s small size makes it feel slightly more dense than most other Ultrabooks. Both have very similar glossy screens, both 1366×768. We were unable to do any battery life testing with the devices. Looking at the Lenovo battery statistics indicates a 39Wh battery, relatively small for an Ultrabook which could impact battery life. The XPS 13 has a 47wh battery. Speakers on both are good although the Lenovo has the more rounded sound in our opinion. 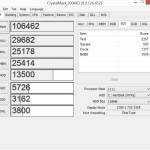 The Core i7 Lenovo U300s we have here is a real performer showing consistently good Turbo boost results but note that the Core i5 version has a slightly less powerful Core i5 than the Dell XPS 13. 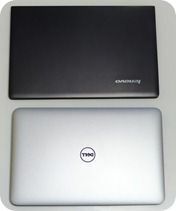 There’s really very little to choose between these two devices but in our opinion, the Dell XPS 13 just has the edge for most customers based on performance, racy looks and value. The mini-display port means you might need to carry a few adaptors though. 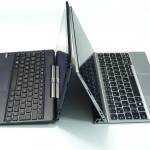 The Lenovo is a solid Ultrabook and in a way, a polite and hi-class choice. That class comes with a slight price premium. But that’s just our opinion; What’s yours? I wonder what kind of effect the heat on the Dell will have on the long term life of the battery? In the next few years with the rise of UB’s & powerful integrated GPU’s, W8 store games, non-replaceable batteries, it will be interesting to see. Do any thin bezel designs have IPS screens of even HQ screens at all? I’m starting to wonder if it’s a technical limitation & not a cost cutting decision. I have been surfing online more than 3 hours as of late, but I by no means discovered any attention-grabbing article like yours. It is beautiful worth sufficient for me. Personally, if all site owners and bloggers made good content material as you did, the web will likely be much more helpful than ever before.